I love rental property! Where else can you leverage your investment for thirty (30) years at a low interest rate and have someone else pay for it? Real estate and rental property are not risk-free; however it is one way to accumulate wealth! It starts with savings and how you invest your money. You can start out small by renting out your first home. What are you waiting for? Why do I love rental property so much? It must be because it is just like the Monopoly game we played as kids! I played Monopoly for hours as a kid with my friends. I loved how I received rent or income just because I owned a property. The rent would increase if I developed the property with homes or hotels. There is nothing wrong with that! I never realized how much those many hours influenced my life until now. One of my very first investments was not in the stock market, but in rental property. Although Monopoly influenced my investments, I needed to learn more about investing in rental property. See, you have much more at stake than just winning a game! It is more than accumulating Boardwalk and Park Place or the most Monopoly money. It is also much harder because it takes more than a few hours to become rich. Yes, there is real money at stake here and you can lose it all. You can make mistakes such as buying an overpriced property or rent to the wrong tenants. Experienced landlords make mistakes too. The factors you thought about when you bought your first home are equally true for prospective renters. Renters and buyers want good locations that are near shopping, good schools and safe neighborhoods. Monthly rent or the price of the property is crucial! Not everyone can rent or buy every house or condominium. You can get more rent or a better price for a good location, but that does not mean it is more profitable! How do you get started? I really recommend not selling your first home and renting it out instead. It may be a “starter” home or a condominium, but it doesn’t matter! If you do not have a property to rent out, you start with your down payment. How much you can invest will determine what kind of property you can buy. If you buy a home or condominium you will need a 20% down payment. If you cannot breakeven with a 20% down payment, you may need to put down more or keep looking for the right property! Will the property generate a profit? Location is everything because you can do a lot of things, but you cannot change location! Location determines neighborhood, schools, property taxes, crime, transportation (freeway access/public transportation), employment, vacancies and rent. A house or apartment in good neighborhood will rent faster for a higher rent than in a bad neighborhood. All these factors determine rent and price. One of the most important factors is access to transportation. It will determine price and the amount of rent you can generate for the property. It also determines the kind of tenant you can attract to the property. Buying rental property is much more about the numbers. Despite that, you still need to make sure the property will show well and has the characteristics of a property that people want to buy or rent. Not every buyer wants to rent their home out! A good property will get a good rent and attract buyers as well. Homes and condominiums attract longer term tenants vs. the average apartment. So do not expect to raise your rent all the time because that scares tenants and vacancies are more expensive. Longer term tenants generally will take care of your place better which means less wear and tear. Rental property normally is priced by how much income is generated. There is an exception with single family homes and condominiums. They sell based on the value of the intrinsic property. Buying a starter home will always be attractive. As property values increase, your asset is growing along with it. In the meantime, your mortgage, property taxes, insurance etc is paid by your tenant and you have an asset that is appreciating. If it was your principal residence for two (2) of the last five (5) years, you can exclude up to $250,000 ($500,000, if a couple) from taxation. This is in addition to deducting mortgage interest, property taxes and other expenses. The remainder is taxed at capital gains tax. You should generate a return on investment of eight (8) to ten (10) percent annually and the property will probably appreciate an average of five (5) percent per year. It is one of the advantages of a leveraged investment. I approach investing in rental property conservatively. I set up reserves for repairs and maintenance which may reduce your annual return on investment. You want to keep up the repairs and maintenance because it maintains your asset value. Keeping your renters happy means you can raise your rent easier and they are less likely to move. If you have a good tenant, you want to keep him/her. It is your investment and you want to safeguard it. Rental property is a great investment opportunity, but it is not for everybody. If you start with your first home or condominium and rent it out, it is a easier transition into rental property. You should refinance to get the lowest mortgage rate because banks charge higher rates for non owner occupied real estate. Some people buy homes and move every few years and take advantage of the principal residence tax exemption and others build a portfolio of rental properties. Some people like the idea of selling off a home and use the proceeds to live on. Either way, it is a great way to accumulate wealth. There is a lot to love about rental property! here is a lot to love about rental property! I have been considering rental property for some time now, but have some reservations. The insanely high cost of homes in my area is a big turn off. I’m not comfortable locking my money down for the several years that it will take to save up the down payment. And that is at my needlessly aggressive 50% savings rate. At this point it seems to make more sense to achieve a basic level of financial independence first, then move into home ownership and rental ownership. The homes here are generally old. Maintenance, and probably expensive maintenance, is guaranteed. There is no gaurantee that I will be living in this area for the long run. I’m not sure that being an absentee landlord with only a couple of properties is the way to go. Real estate is local, but you can still participate with REITS. You can buy shares of investment properties such as apartments and still have some of the upside of the rental market. I have been thinking about assembling a sizable REIT portfolio. But that is still in the planning stages. I think it is important to have a diversifies portfolio and real estate is part of it. Whether it is a REIT or actual real estate. Be careful though, many REITS are commercial or apartments. I think apartments are going to be good until construction catches up. I do not have any idea when business will expand again. Wooooohooooo!!! We also love rental property!!! Love love LOVE it! It was one of the best decisions we ever made. We are also conservative when it comes to rental property management. However, I suggest buying a nicer piece of property. Nicer properties generally lure better tenants – which equals less problems and less cost. Great, I always believe you should buy properties that make sense for you. It is all always about the numbers! Good post! We’ve wanted to get into rental property for a while but have not pulled the trigger on it yet. I am not good at all with my hands thus would require to more than likely hire that out. That said, I think it can be a great way to diversify your investing, not to mention the cheap rates available these days. I am not particularly good with my hands either, but I can find good tradesmen who work reasonably. I always liked rental property because it would counter the stock market volatility and I had more control over it. Thanks! Right now, houses are reasonable and the rates are low. Normally income property is more expensive and generally have higher rates. Good luck. Instead of renting an actual home or condo we currently own quite a number of shares with an investment corporation that buys land and apartment buildings across Canada. Is it a publicly traded corporation? In the U.S., you can invest in REITS that do that. I think that is an excellent alternative. The only shortcoming is you lose out on leverage, but you won’r have any tenant problems. I kept my first house and rented it out. I’ve always wanted to dip my hand into rentals and I am glad I did. Now I am saving up for another rental. The only downside I had was that I couldn’t refi when I was living there because it was (and still is) underwater. But, the rate isn’t terrible and someone else is paying the mortgage so it isn’t the end of the world. It is the start of a real estate empire! It is also a good solution for underwater properties. Thanks for writing this post. I plan on purchasing an investment property once we have our mortgage paid in full and have been trying to read up on the subject. You’re welcome! Try to find a realtor who understands the rental market too. 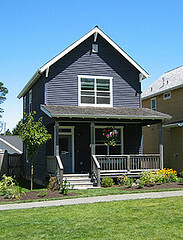 Starter homes are good rentals because there is always a demand for low priced homes for rent and sale. This is a perfect time to get into rental property in our area. We were able to purchase our first residential rental this past year and renovate it for under $70k, and it cash flows well. Your point about keeping reserves available is very important. We ran into a few snags and it took a month longer than expected to get tenants. We hope to snag another property or two within the next few years. That’s great! Keep your plans conservative and reasonable because your bank will too. You want to show good cash flow and good earnings. Good luck. Buying a rental property (and someday multiple rental properties) is something that the bf and I are very interested in. Right now we’re saving up a downpayment. We’ll probably buy in my home state, Maine, because property here (NYC) is way too expensive. We will however rent out our place when we move in a few years. Personally, I like local real estate because you want to look after it and stop by occasionally. Would you use the Maine house for summer rentals? There will always be a huge demand for NYC apartments. I agree with you on the location thing. It really does play a huge role. I have a couple of investment properties in the midwest where the home prices are great for the value. I always make sure to buy homes that don’t need a lot of work though as I’m not handy with that kind of stuff nor do I want to spend the money on fixing something up. I’ll pay a little more for a home in good condition. I think a variety of factors go into valuing a property. Sometimes you can get a better deal, if it needs some work. The work can be a serious remodel or cosmetic such a coat of paint. I also love rental property as you probably realize already. We started because we couldn’t sell our first house when upgrading to more space. From there it became a passion of mine. With the kids getting into their peak spending years, I haven’t been able to add, but am working on paying down debt, and freeing up some cash flow so I can buy some more. Just owning one rental is a good start. You are keeping up or beating inflation and diversifying your investments. I totally love rental property as well. I have a few and they are all “cost neutral”, but not bad. Each one I rent to a contractor; it is in our lease that they do ALL repairs. How cool is that! Have a great weekend! Your tenant can be a great resource to find fixer type properties. One of the best parts of rental property is the tenant paying for your asset. We will be looking to building a rental portfolio over the next few years among other investments. Prices are probably near the floor at the moment but we still need to be careful. Cuts in universities going on over here mean that student accomodation, a regular standby, will be oversupplied so rents will fall and there will be little capital appreciation. Always, look for the right property that makes sense. I hate real estate people who try to sell you on potential. It has to make sense today, the potential is a bonus. Very helpful tips. Investing in real estate is risky, so it is better to have enough knowledge before engaging yourself into it. Every investment has risks that is why there is a reward for doing it. You should always learn about any investment you want to make in order to make a a good decision. I recently dealt with some rental property and was surprised by the hoops that landlords have to jump through in the UK. Every year they have to have gas and electric inspections, and a lot of bureaucracy. This has made us revisit the idea of rental income, however desirable it may seem, in favour of something rather more passive, if we can find it! Every investment has its negatives! The best part of rental property is the fact you leverage your investment at a low interest rate. Good luck. We bought our first home in 2003, and then kept it as a rental property when we moved into our current home in 2009. Our current home also has a basement apartment, so now we have two sources of rental income. We’re looking to buy a third home either this year or next year – and hope to buy a few more before we retire. It is a risky venture, but the payoff is well worth it! I see rental property as a calculated risk. You can minimize your risk by buying right and screening your tenants really well. The only issue is repairs and maintenance which can be identified or reserved. Good luck. I would love to buy a condo to rent out. I think it makes perfect sense. One day…. Start looking! One of my friends told me about some condos that were selling for $50K at the bottom of the market. Krantcents, great read on the rental property post, I agree rental property is a great way to leverage someone else’s money. I have 2 properties as well, but nervous about the future of the US’s financial state. Do you see the rental market a good investment should interest rates skyrocket? Now it is a good time to lock in a good rate. If there is inflation rentals go up too. Sounds like a win/win! I’ve tried to convince my parents to start renting out one side of our house (set up like a duplex), but they won’t do it. They got burned in the past, so they won’t try renting out again. It’s a shame because I know what kind of money we are just sitting on and not making. Too bad there isn’t a perfect tenant. No one is perfect, but there are good tenants out there. You have screen and being willing to wait. Rental property is a nice way to invest but yes it can take a lot of work and isn’t for everyone. It’s worth it not to rush finding a good tenant to avoid a lot of potential headaches too. I agree, many landlords just think about the lost rent and should think about years of difficulty. I personally no longer own a rental property but if you can finance and occupy a home I believe you are setting yourself up for success. One of these days I will be a landlord again but not for a while. I believe that the only people who benefit from real estate are investors. If you’re renting it is an expense and if you’re an owner living in your own home you are consuming that property, therefore it’s not an investment. For me, rental property was a way to accumulate wealth. It wasn’t easy, but well worth it. What % did you set aside for repairs and remodeling? I’d love to see an in depth series from you about rental property. You should set aside 1-3% of property value. If you know that your property is in poor repair or has a lot of deferred maintenance, you take actual estimates and accrue for it. For example, if you know you have a 20 year old water heater, you will replace it in the next year or two. You reserve for it. if the property is in good shape, the 1-3% will probably work fairly well, but you may want update it or reserve more. Thanks for the estimate. I would have thought it would have been higher. We are dealing with a bit of property now, so this figure is helpful. Don’t forget to adjust based on deferred maintenance or obvious repairs.